This article is about the explorer. For other uses, see Amerigo Vespucci (disambiguation). 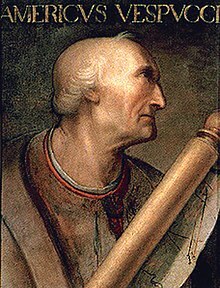 Amerigo Vespucci (/vɛˈspuːtʃi/; Italian: [ameˈriːɡo veˈsputtʃi]; March 9, 1454 – February 22, 1512) was an Italian explorer, financier, navigator, and cartographer who was born in the Republic of Florence. Sailing for Portugal around 1501-1502, Vespucci demonstrated that Brazil and the West Indies were not Asia's eastern outskirts (as initially conjectured from Columbus' voyages) but a separate, unexplored land mass colloquially known as the New World. It came to be called "the Americas", a name derived from Americus (the Latin version of Vespucci's first name). He became a citizen of the Crown of Castile and died in Seville (1512). Vespucci was born and raised in Florence, on the Italian Peninsula. He was the third son of Ser Nastagio (Anastasio) Vespucci, a Florentine notary, and Lisabetta Mini; Anastasio's father was also named Amerigo. His family lived near All Saints' Church in Ognissanti, which was also known as San Salvatore, which may have influenced his naming of the Bay of All Saints and the city of Salvador, Bahia. Vespucci was educated by his uncle, Giorgio Antonio Vespucci, a Dominican friar in the monastery of San Marco in Florence. Although his elder brothers were sent to the University of Pisa to pursue scholastic careers, Amerigo embraced a mercantile life and was hired as a clerk by the Florentine house of Medici (headed by Lorenzo de' Medici). Vespucci's patron was Lorenzo di Pierfrancesco de' Medici, who became head of the business after the elder Lorenzo's death in 1492. The Medici dispatched Donato Niccolini and the 38-year-old Vespucci in March 1492 as confidential agents to investigate the Medici branch office in Cádiz, whose managers (and dealings) were under suspicion. In April 1495, due to the intrigues of Bishop Juan Rodríguez de Fonseca, the Crown of Castile broke their monopoly deal with Christopher Columbus and began licensing other navigators for the West Indies. Around this time (1495–96), Vespucci was engaged as executor of the estate of Giannotto Berardi, an Italian merchant who had recently died in Seville. Vespucci organized the fulfillment of Berardi's contract with the Castilian crown to provide twelve vessels for the Indies. After they were delivered, he continued as a provisions contractor for Indies expeditions and is known to have secured beef for at least one (if not two) of Columbus' voyages. Vespucci's expeditions became known in Europe after two accounts attributed to him were published between 1502 and 1503. In 1507, Martin Waldseemüller produced a world map on which he named the new continent America after the feminine Latin version of Vespucci's first name. In an accompanying book, Waldseemüller published one of the Vespucci accounts; this led to criticism that Vespucci was trying to usurp Christopher Columbus' glory. The 18th-century rediscovery of other letters by Vespucci has led to the view that the early published accounts (notably the Soderini Letter) could be fabrications, not by Vespucci but by others. Two letters attributed to Vespucci were published during his lifetime. Mundus Novus (New World) was a Latin translation of a lost Italian letter sent from Lisbon to Lorenzo di Pierfrancesco de' Medici describing a voyage to South America in 1501–1502. It was published in late 1502 or early 1503 and reprinted and distributed in a number of European countries. Lettera di Amerigo Vespucci delle isole nuovamente trovate in quattro suoi viaggi (Letter of Amerigo Vespucci concerning the isles newly discovered on his four voyages), known as Lettera al Soderini or just Lettera, was a letter in Italian addressed to Piero Soderini, published in 1504 or 1505. 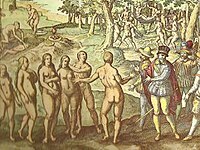 It was a purported account of four voyages to the Americas made by Vespucci between 1497 and 1504. A Latin translation was published by Martin Waldseemüller in 1507 in Cosmographiae Introductio as Quattuor Americi Vespucij navigationes (Four Voyages of Amerigo Vespucci), a book on cosmography and geography. On March 22, 1508, King Ferdinand made Vespucci chief navigator of Spain at a large salary and commissioned him to found a school of navigation to standardize and modernize navigation techniques used by Iberian sea captains exploring the world. Vespucci developed a rudimentary but fairly accurate method of determining longitude, which was improved by more accurate chronometers. During the 18th century, three unpublished letters were rediscovered from Vespucci to Lorenzo de' Medici. One describes a voyage made in 1499–1500 which corresponds with the second of the four reported voyages. Another was written from Cape Verde in 1501 in the early part of the third voyages, before crossing the Atlantic. The third letter was sent from Lisbon after the completion of that voyage. It has been suggested that Vespucci exaggerated his role and created deliberate fabrications in the two letters published during his lifetime. Scholars now believe that he did not write the two letters; they were fabrications by others, based in part on genuine letters by Vespucci. The publication and widespread circulation of the letters may have led Waldseemüller to name the new continent America on his 1507 world map in Lorraine. Vespucci used a Latinized form of his name (Americus Vespucius) in his Latin writings, which Waldseemüller used as a base for the new name in its feminine form. According to the book accompanying the map, "I do not see what right any one would have to object to calling this part, after Americus who discovered it and who is a man of intelligence, Amerige, that is, the Land of Americus, or America: since both Europa and Asia got their names from women". Vespucci may not have been aware that Waldseemüller named the continent after him. The two disputed letters say that Vespucci made four voyages to America; at most, two can be verified by other sources. It is disputed as to when Vespucci first visited the mainland; according to historians such as Germán Arciniegas and Gabriel Camargo Pérez, his first voyage was made in June 1497 with Spanish pilot Juan de la Cosa. Concerning my return from those new regions which we found and explored… we may rightly call a new world. Because our ancestors had no knowledge of them, and it will be a matter wholly new to all those who hear about them, for this transcends the view held by our ancients, inasmuch as most of them hold that there is no continent to the south beyond the equator, but only the sea which they named the Atlantic and if some of them did aver that a continent there was, they denied with abundant argument that it was a habitable land. But that this their opinion is false and utterly opposed to the truth… my last voyage has made manifest; for in those southern parts I have found a continent more densely peopled and abounding in animals than our Europe Asia or Africa, and, in addition, a climate milder and more delightful than in any other region known to us, as you shall learn in the following account. A letter, written to Piero Soderini and published in 1504, purports to be an account by Vespucci of a visit to the New World on which he left Spain in May 1497 and returned in October 1498. Some modern scholars[b] doubt that the voyage took place, however, and consider the letter a forgery. Whoever wrote the letter makes several observations about native customs, including the use of hammocks and sweat lodges. Around 1499–1500, Vespucci joined an expedition in the service of Spain with Alonso de Ojeda (or Hojeda) as the fleet commander. Its intention was to sail around the southern end of the African mainland into the Indian Ocean. After reaching the coast of present-day Guyana, Vespucci and de Ojeda seem to have separated. Vespucci sailed south, discovering the mouth of the Amazon River and reaching 6°S before turning around, seeing Trinidad and the Orinoco River, and returning to Spain via Hispaniola. The letter, to Lorenzo di Pierfrancesco de' Medici, says that Vespucci determined his longitude celestially on August 23, 1499 on this voyage. The claim may be fraudulent, however, which could cast doubt on the letter's credibility. Engraving of Vespucci by Crispijn van de Passe which calls him the "discoverer and conqueror of Brazilian land"
Vespucci's last certain voyage was led by Gonçalo Coelho in 1501–1502 in the service of Portugal. Departing from Lisbon, the fleet sailed first to Cape Verde and met two of Pedro Álvares Cabral's ships returning from India. In a letter from Cape Verde, Vespucci said that he hoped to visit the same lands that Álvares Cabral had explored (suggesting an intention to sail west to Asia as on the 1499–1500 voyage). Reaching the coast of Brazil, they sailed south along the coast of South America to the Rio de Janeiro bay. If Vespucci's account is correct, he reached the latitude of Patagonia before turning back; this seems doubtful, however, since his account does not mention the broad estuary of the Río de la Plata which he would have seen if he had reached that far south. Portuguese maps of South America created after Coelho and Vespucci's voyage do not show any land south of present-day Cananéia (25° S), which may have been the southernmost extent of their voyages. After the first half of the expedition, Vespucci mapped Alpha Centauri, Beta Centauri, the constellation Crux, and the Coalsack Nebula. Although these stars had been known to the ancient Greeks, gradual axial precession had lowered them beneath the European horizon and they had been forgotten. Returning to Lisbon, Vespucci wrote in a letter from Seville to Lorenzo di Pierfrancesco de' Medici that the land masses they explored were much larger than anticipated and different from the Asia described by Ptolemy or Marco Polo; therefore, they must be a New World: a previously-unknown fourth continent in addition to Europe, Asia, and Africa. Vespucci's fourth voyage, another expedition for the Portuguese crown down the east coast of Brazil, set out in May 1503 and returned in June 1504. Like his reported first voyage, Vespucci's fourth (and final) voyage is also disputed. The only source for this last voyage is the Soderini Letter; since several modern scholars dispute Vespucci's authorship of that letter, it is uncertain if Vespucci undertook this trip. [b] Portuguese documents confirm a voyage in 1503–04 by Gonçalo Coelho (probably the same captain as the 1501 mapping expedition, Vespucci's third voyage), so it is possible that Vespucci went on this one as well. It is not independently confirmed that Vespucci was aboard, and there are difficulties with reported dates and details. The letters were controversial after Vespucci's death (particularly among supporters of Columbus, who believed that Columbus' achievement was being denigrated), and damaged Vespucci's reputation. Vespucci, a cousin of the husband of Simonetta Vespucci, married Maria Cerezo. One of the few references to Maria is in a royal decree in 1512,[c] giving her a lifetime pension of ten thousand maravedís per year (deducted from the salary of Vespucci's successor). They had no children. Soon after his return to Spain, Vespucci became a Spanish citizen. On March 22, 1508, he was made the country's pilot major by Ferdinand II of Aragon in honor of his discoveries. Vespucci ran a school for navigators in Seville's Casa de Contratación. He died on February 22, 1512 at his home in Seville. a Europeans had long conceptualized the Afro-Eurasian landmass as divided into the same three continents known today: Europe, Asia, and Africa. When cosmographers realized that the New World was not connected to the Old (but before it was fully mapped), they considered the Americas a single, fourth continent. b The authenticity of Vespucci's authorship of the 1504 Mundus Novus and the 1505 Letter of Soderini, the only two texts published during his lifetime, was questioned by Magnaghi (1924). He suggested that the Soderini letter was not written by Vespucci, but was cobbled together by unscrupulous Florentine publishers who combined several accounts – some from Vespucci, others from elsewhere. Magnaghi was the first to propose that only the second and third voyages were true (since they are corroborated in Vespucci's other manuscript letters), and the first and fourth voyages (only found in the Soderini letter) were fabricated by publishers. The later (1937) discovery of a corroboting Vespucci manuscript letter for the first voyage – the "Ridolfi fragment" (Formisiano, 1992: pp. 37–44) – means that only the fourth voyage is found in Soderini alone. The Magnaghi thesis has been a divisive factor in Vespucci scholarship. It was accepted and popularized by Pohl (1944) and rejected by Arciniegas (1955), who posited that all four voyages were truthful. Formisiano (1992) also rejects the Magnaghi thesis (acknowledging that publishers probably tampered with Vespucci's writings) and declares all four voyages genuine, but differs from Arciniegas in details (particularly the first voyage). Fernández-Armesto (2007: p. 128) calls the authenticity question "inconclusive", and hypothesizes that the first voyage was probably another version of the second; the third is unassailable, and the fourth is probably true. c Ober gives the date of the decree as May 22, but Catholic Encyclopedia has it as March 28. ^ See Encyclopædia Britannica Online "Amerigo Vespucci" and Room, Adrian (2004), Placenames of the world: origins and meanings of the names for over 5000 natural features, countries, capitals, territories, cities and historic sights; the Americas are believed to have derived their name from the feminized Latin version of his first name. ^ Rival explanations have been proposed; see Arciniegas, Germán. Amerigo and the New World: The Life & Times of Amerigo Vespucci. Translated by Harriet de Onís. New York: Octagon Books, 1978. [page needed] Although speculation exists that the name's origin may be Richard Amerike BBC or the Amerrique region of Nicaragua, neither theory has been accepted by mainstream academics. ^ a b c d C.R. Markham (1894) "Introduction", in The Letters of Amerigo Vespucci and other documents illustrative of his career. London: Hakluyt. ^ Piero Bargellini, Ennio Guarnieri, Le strade di Firenze, 4 voll., Firenze, Bonechi, 1977–1978, II, 1977, pp. 337–340. ^ a b Lester, Toby (December 2009). "The Waldseemüller Map: Charting the New World". Smithsonian. ^ Roukema, E. (1962). "The Mythical "First Voyage" of the "Soderini Letter"". Imago Mundi. 16: 70–75. JSTOR 1150303. ^ a b c Formisano, Luciano (Ed.) (1992). Letters from a New World: Amerigo Vespucci's Discovery of America. New York: Marsilio. ISBN 0-941419-62-2. Pp. xix–xxvi. ^ Vespucci, Amerigo. "Letter from Seville to Lorenzo di Pier Francesco de' Medici, 1500." Pohl, Frederick J. Amerigo Vespucci: Pilot Major. New York: Columbia University Press, 1945. 76–90. Page 80. ^ Mundus Novus: Letter to Lorenzo Pietro Di Medici, by Amerigo Vespucci; translated by George Tyler Northrup, Princeton University Press, 1916. ^ "Life of Amerigo Vespucci". Millersville.edu. Archived from the original on 2010-03-28. Retrieved 2010-02-28. ^ "Account of alleged 1497 voyage". Fordham.edu. Retrieved 2010-02-28. ^ a b O'Gorman, Edmundo (1961). The Invention of America. Indiana University Press. pp. 106–107. ^ Dekker, Elly (1990), Annals of Science, vol. 47, pp. 535–543. ^ "Amerigo Vespucci". HISTORY. Retrieved 2018-10-13. ^ Fernández-Armesto (2007: pp. 168–169). Uzielli, Gustavo (1913). "Amerigo Vespucci" . In Herbermann, Charles. Catholic Encyclopedia. 15. New York: Robert Appleton. ^ Hoogenboom, Lynn (2005-09-01). Amerigo Vespucci: A Primary Source Biography. The Rosen Publishing Group. ISBN 978-1-4042-3037-8. ^ Donaldson-Forbes, Jeff (2002-01-01). Amerigo Vespucci. The Rosen Publishing Group. ISBN 978-0-8239-5833-7. Fernández-Armesto, Felipe (2007) Amerigo: The Man Who Gave his Name to America. New York: Random House. Formisano, Luciano (1992) Letters from a New World: Amerigo Vespucci's Discovery of America. New York: Marsilio. Ray, Kurt (2003) Amerigo Vespucci: Italian Explorer of the Americas, The Rosen Publishing Group, 2003 ISBN 0-8239-3615-5. Wikimedia Commons has media related to Amerigo Vespucci. Wikisource has the text of the 1900 Appletons' Cyclopædia of American Biography article Amerigo Vespucci. Wikisource has the text of the 1911 Encyclopædia Britannica article Vespucci, Amerigo. Mason, Wyatt, 'I am America. (And So?)' The New York Times, December 12, 2007. Martin Waldseemüller, Franz Wieser (Ritter von), Edward Burke (trans), The Cosmographiæ Introductio of Martin Waldseemüller in facsimile: followed by the Four voyages of Amerigo Vespucci, The United States Catholic Historical Society, 1908. World Digital Library presentation of the 1507 Waldseemüller Map in the Library of Congress. This is the only known surviving copy of the wall map edition of which it is believed 1,000 copies were printed. Four originals of the 1507 globe gore map are in existence in Germany, UK and US. Online Galleries, History of Science Collections, University of Oklahoma Libraries High resolution images of works by and/or portraits of Amerigo Vespucci in .jpg and .tiff format. Soderini Letters in Giovanni Battista Ramusio, Primo Volume delle Nauigationi et Viaggi, Venetia, 1550, fol.138–140.